PEACE SAILING FROM PUGLIA ( ITALY) TO JERUSALEM..
2019 OPEN SAILS is organized by a group of boat owners who enthusiastically welcomed an idea by Alfonso Casale. A sailing and cultural crossing to match our passion for the sea and the enjoyment of re-living the greatest and most important trip to the three times Holy Town of Jerusalem. 2019 OPEN SAILS has become so quickly a sailing whose aim is to gather enthusiasts around history, art,old sea courses and wonderful Greek islands. It will also highlight the idea that the Mediterranean must be both a sea of peace and communication among people and not a place of suffering and clashes. 2019 OPEN SAILS will leave Puglia (Italy) on 12thJuly 2019 heading for Jerusalem. 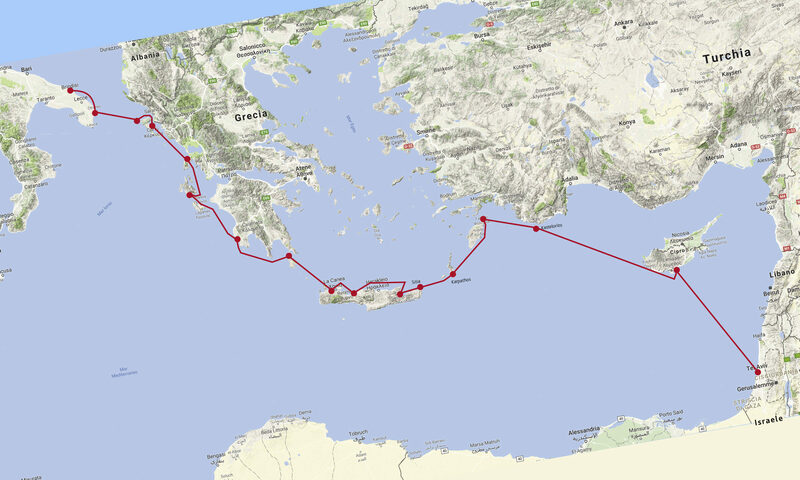 A non- competitive sailing trip that will call at 16 ports in about 32 days. We would not like more than seven/eight boats with us as we will favour an amateur approach and an easy technical management of sailing. We want to live up to a “slow” tourism as set out by MIBACT fot the 2019 celebrations. Many cruises have already taken place in the past, but never in a group willing to match passion, ethics and culture. We are going to give the event a high profile at a national level. Our relations with local institutions, the Lega Navale Italiana (Italian Sailing League), sailing and sea associations and several Italian universities have already made good progress so far and Italian media will highlight our initiative. We intend to write a book, set up a programme for a satellite channel, keep a blog and social media (Instagram, FB, Linkedin, Twitter) . These will be available in future on an Internet site to suggest to other people a course to follow again and a culture of tolerance to share. For more information we are on Linkedin.